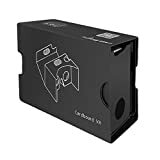 The Google Cardboard Version 2 is an elegant yet cheap way to enjoy a 3d virtual reality experience using just your smartphone! Compatible with smartphones having screens up to 6" including the iPhone 6, Samsung Galaxy S6, and Google Nexus 5. 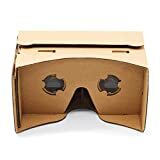 The K&F Ideas Google Cardboard V2 inspired design is precise and simple. 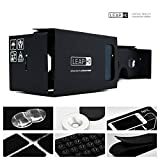 The easy 3 step setup instructions are printed along with the QR code right on the box so you can get going on your virtual reality adventures in no time! The pre-built design means there is no hassle, just open and play! The 37mm diameter (34mm viewable) built in biconvex lenses provide a 45mm focal length for a stunning HD visual experience. 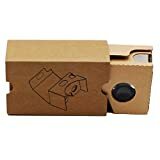 The adjustable head strap and conductive foam button make the Google Cardboard fun and easy to use. Enjoy a huge array of virtual reality apps that you can download straight to your smartphone. 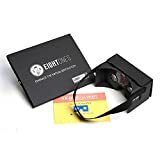 Walk through cities around the world, play games, and enjoy all kinda of exciting VR adventures! 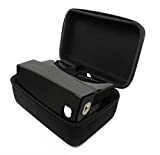 The K&F Ideas Google Cardboard V2 comes in a protective box to ensure the finest quality.